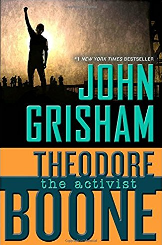 In The Activist by John Grisham, Theodore Boone finds himself in the middle of a hot, political and environmental issue. The county commission is fighting hard to build a “bypass to nowhere” that will cost two hundred million dollars destroy fifty homes, a hiking trail, several farms, a historic church, and bring about twenty-five thousand cars and trucks per day to the front door of Jackson Elementary School. Theo opposes these plans and will do whatever it takes to stand up for what is right, and stop the bypass to nowhere from being built. The Activist is the fourth book out of six in the Theodore Boone series. All of the books revolve around law, since Grisham himself is an attorney. This series is geared toward pre-teens/young teens and helps readers learn more about the legal system through an interesting plot. Of the first four books The Activist is the least action-packed, but it’s still an exciting novel. Throughout the book, Grisham has a strong theme of fighting for what you believe in. Theo thinks the bypass should not be built, so he organizes kids, makes, a video, and does whatever else it takes to fight for what he believes in. Grisham uses a third-person view. Even though it's not first-person, readers still connect to Theo. The thoughts and feelings were great: Grisham let’s readers see how Theo feels about the bypass and about Judge. Grisham also does a great job with the dialogue. The dialogue shows relationships between characters, and how Theo feels about issues. Grisham does a good job of making it realistic. Grisham keeps readers wondering what will happen next with plot twists and driving questions: if the bypass would be built, and what secrets Theo would uncover next. Grisham uses strong visuals, as well. Readers will see Judge, Theo, Hardie, and Woody when they are attacked, along with the commissioners meeting. Grisham’s mystery novel is a perfectly paced narrative filled with plot twists, driving questions, strong visuals, and great themes. This makes the book an absolute ten to all readers.